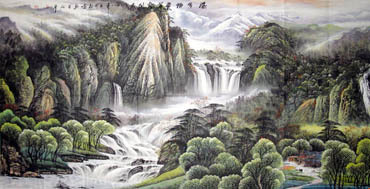 In Chinese culture, water symbolizes wealth, and the waterfall represents profits pouring in from all sides. 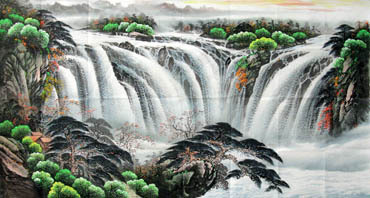 Therefore, Chinese waterfall painting is a well-received theme for Chinese painting. 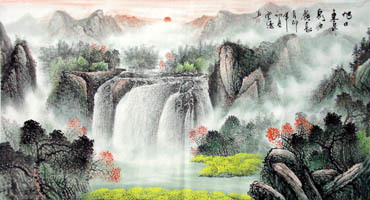 For Chinese waterfall Fengshui painting, every element has its own meaning. 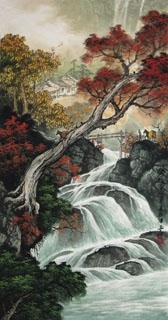 The moutain just behind waterfall stands for the patron. 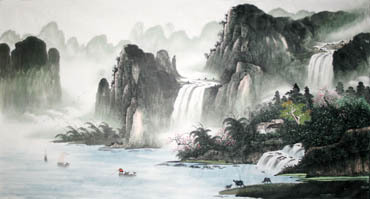 The faraway mountains is symbolic of long stading and well established. The morning sun implies lucky strike, also means that the hard times already past and the good days has come. 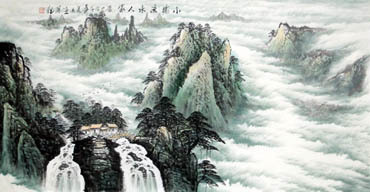 Trees on the left side painted for bringing wealth, trees on the right side painted for keeping off misfortune. 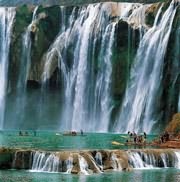 If there is a pathlet on the left side of waterfall, it will lead the wealth to your home. And if there is a person who carring firewood (with a shoulder pole), he represents lucky boy. 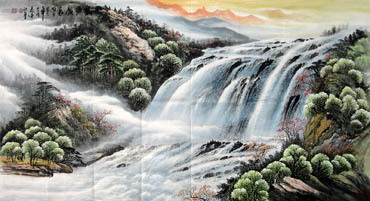 In composition of some waterfall paintings, there is a lake or plunge pool next to the fall. It has a very auspicious name called "treasure bowl", which can make wealth increase at an alarming rate according to legend. 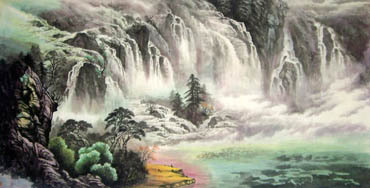 And if two waterfalls are painted in one painting (one is on the left, another is on the right), that means owner will be blessed with good luck all along. InkDance Price: USD 712 /GBP 584 /EUR 677 Sold, you can customize it. InkDance Price: USD 953 /GBP 782 /EUR 906 Sold, you can customize it. InkDance Price: USD 575 /GBP 472 /EUR 547 Sold, you can customize it.